Have you ever driven by someone’s house in the Greenville, NC area and noticed a big ugly oil stain in their driveway? Or maybe their driveway was just dirty and discolored looking? Like a lot people, your initial reaction was probably something along the lines of, “wow, that looks awful, they must not take very good care of their home”. Now, here is the moment of truth… Have you taken a look at your own driveway lately? What does your driveway say about you? Your Driveway’s Appearance Cannot Be Overlooked Your home’s driveway is much more than just a place to park your car or a way to get into your garage. It’s actually a focal point of your property, and making sure it has a bright, clean, fresh looking appearance plays an important role in the overall curb appeal and value of your property. Does Your Driveway Need A Little TLC? 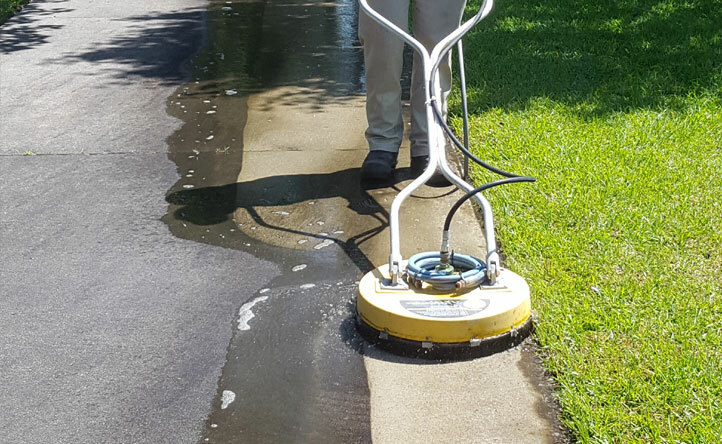 Our concrete power washing and surface cleaning services are the ideal way to wash away those unsightly oil spots, grease marks, and rust stains. And of course, we can effectively remove the unsightly buildup of dirt and grime, leaf stains, and drainage discolorations. We Power Wash More Than Just Driveways! We can clean nearly any concrete, brick or stone exterior surface on your property, from sidewalks and walkways, to patios, porches, and pool decks. Want to know more or schedule a Concrete Power Washing estimate? Give us a call in the Greenville, NC area at (252) 258-5975. Or CLICK HERE to contact us online.